Today, here in Las Vegas, I did something that made my soul scream. No, it didn’t involve gambling, drugs, or strippers. I gamed on a Mac. Wait! Come back. This wasn’t the shovelware or six-year-old games that Mac users are used to. (Don’t play, you know I’m speaking the truth.) I played Witcher 3—a game that’s never been released on Macs. On a GeForce GTX 1080—a graphics card never found in Macs. And it was all thanks to Nvidia’s new GeForce Now streaming service for PCs and Macs. Think of it like Netflix for PC games that also happens to work on Macs. 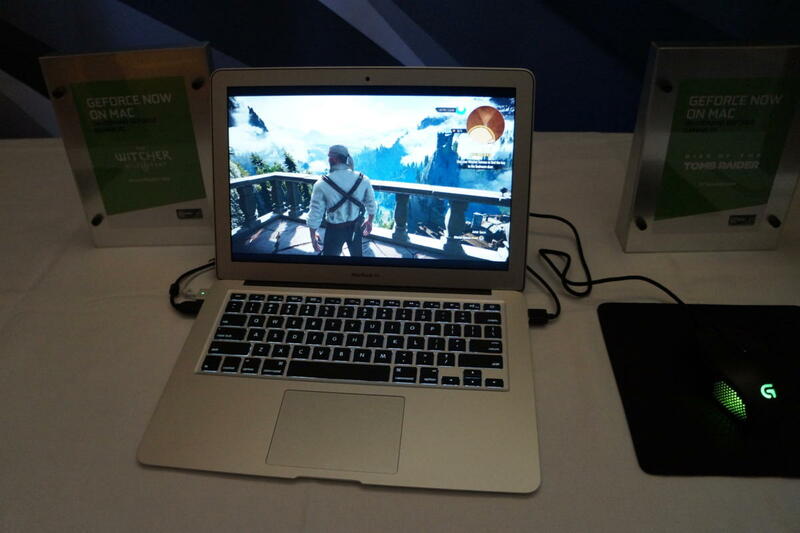 Witcher 3 running on a MacBook Air over GeForce Now. The PC and Mac version of GeForce Now is a completely different beast from the subscription service of the same name that’s available for Nvidia’s swanky Shield TV, because that won’t get confusing or anything. While the Shield version grants you access to a number of PC games with your subscription, with the ability to buy others if you’d like, you’ll need to actually own the games you want to play with the PC and Mac version of GeForce Now. This GeForce Now instead is basically renting your own powerful, virtual gaming PC in the cloud, then playing any game you own on it—be it on Steam, Origin, Battle.Net, uPlay, you name it—from any PC or Mac, with saves and settings carrying over from device to device. Nvidia makes sure all your goodies stay patched and up to date in the cloud, too. 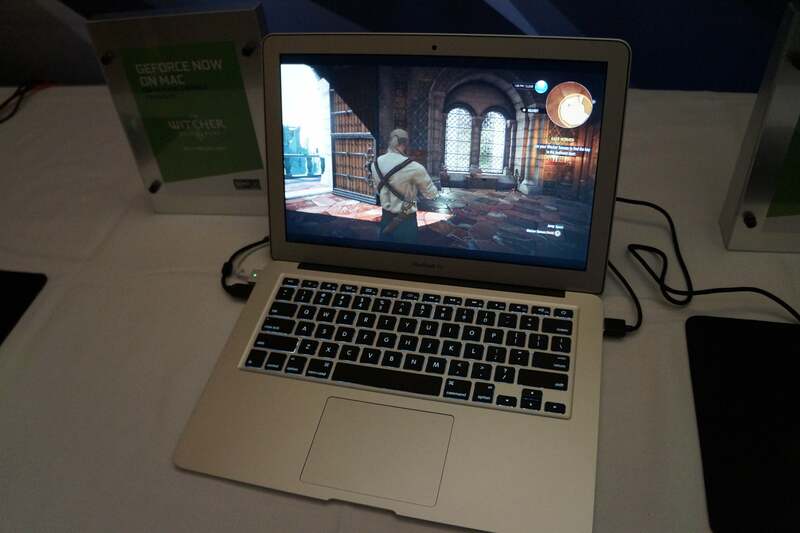 So thanks to the power of the Interwebz, I played Witcher 3 on a MacBook Air today—and it went pretty damned well! I didn’t notice any extreme hitching, buffering, or latency no matter how wild I acted in-game or how violently I shook the mouse. The same was true when I played Rise of the Tomb Raider on a Retina iMac—though neither game was being showcased in particularly action-packed levels. 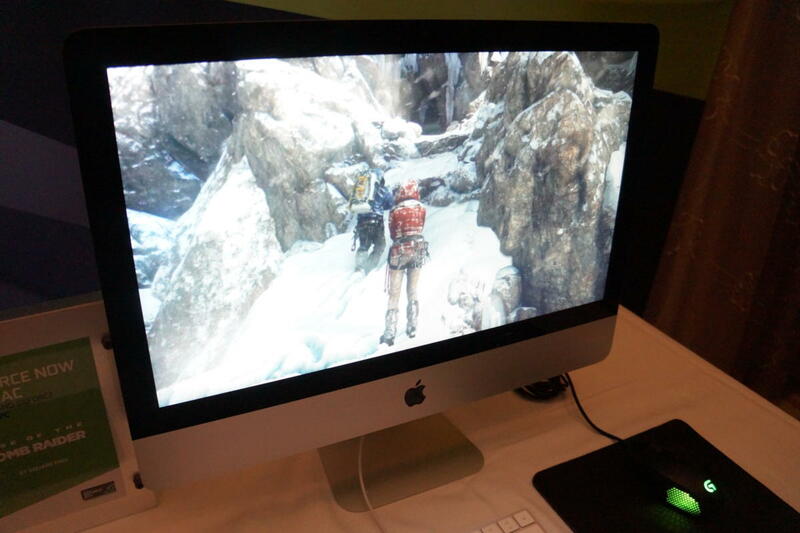 Rise of the Tomb Raider running on an iMac with Nvidia’s GeForce Now. For $25, Nvidia lets you play either 20 hours of gameplay on a virtual PC with the power of a GTX 1060, or 10 hours of GTX 1080-level oomph, all at up to 1080p resolution. The GTX 1080 lets you crank every possible bell and whistle in games at that resolution, but Nvidia actually lets you mix and match “graphical firepower levels,” so you can use a GTX 1080 for games like The Witcher 3 or a GTX 1060 to jam on Rocket League. The elephant in the room is that cost, which my colleague Hayden Dingman already covered with disgruntled skepticism in his initial coverage of GeForce Now for PCs and Macs. And there’s no two ways around it: This isn’t a cheap proposition, especially since you need to BYO games. But if you have a strong home network capable of hitting 25Mbps and either a non-gaming laptop or—I’m sorry—a Mac, GeForce Now might just be what the doctor ordered. Because when it comes down to brass tacks, everybody should play The Witcher 3 at least once.